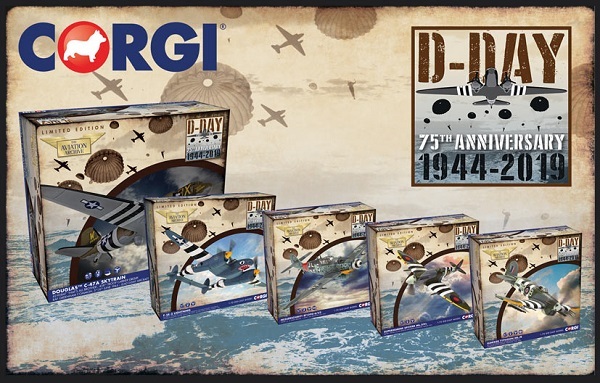 As June 6th, 2019, marks the 75th Anniversary of the D-Day invasion, Corgi presents a range of limited edition Aviation Archive models, in special commemorative packaging, to mark the 75th anniversary of the liberation of Western Europe. The C-47 was one of the most successful aircraft ever, praised by General Eisenhower as one of the most important instruments of victory in WWII. Largely a military version of the highly successful Douglas DC-3 passenger aircraft, the C-47 Dakota carried supplies, airborne troops, and other personnel in all of the theaters of conflict in WWII.